I must be mad. 50 Blocks in 50 weeks! 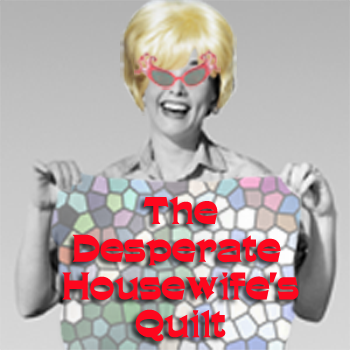 July 1st is the kick off date for ‘The Desperate Housewife’s Quilt’. I will be presenting 50 original blocks over 50 weeks. I will show you how to make these 8″ finished blocks in easy to follow tutorials, covering as many techniques as possible. These blocks can be made into a sampler quilt or just used as a solo block to make a full quilt. It is not a quilt-a-long. It’s a ‘only quilt as you wish’ -a-long. I will be using fabrics from my stash – solids, reproductions, modern retros – anything goes. I will even throw in the occasional giveaway or two (or three). Why should I have all the fun? The first fifteen volunteers to leave a comment (with contact details) will be chosen to create a unique 8″ finished block and write a tutorial showcasing its amazing beauty and functionality. So let the Desperate Housewives begin their adventure, toss off their slippers, slip on their red stilettos, grab a martini and get sewing. I was all ready to volunteer when I saw the word, until I saw what you had to volunteer for…. create a unique 8" block!! I'm not sure I can do that…. but if you want to add me to the list, just put me a long way down so I've got a chance to think up something 😉 I've never designed a block before. Feel free to bump me off if someone else is eager! Hey Jane, ofcourse I'd love to design a block for the Desperate Housewives Quilt. This is just what I need — a regular quilting activity for which to be responsible. I'm in. And, yeah, I think I could come up with a block of my own. Sounds very interesting! I am still deciding if I should put my hand up to do a block or not…let me know if you need me! Block design? Why not? I would be glad to give it a try! The only part that worries me is the "unique" bit. There are so many out there, how do you know if you are unique? I can check something off my bucket list. I'd love to participate. I just found you via another blog. I would love to follow along but I don't know that I am up to designing a block. Thanks anyway! Oh, I changed my mind…delete my earlier comment….I do know what I can design. If I made it in the top 15 that is. I am excited! How fun! I'm not anywhere near ready to volunteer for unique tutorial sessions or anything, but totally can't wait to follow along with my own stash to make a sampler quilt! Sounds like great fun. I've never created a unique 8" block before, but hey there is always a first time! How fun!! I would love to volunteer and contribute a block design if I've made it in the first 15. What a great idea! Great idea! I'd love to share a block! I'd love to take on this challenge if there is still room. Please don't put me in the first 4 weeks though okay? I am excited to see if I will be up to the challenge. 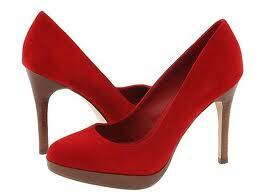 As long as I don't have to wear those red high heels, I will have a constant nose bleed and twisted ankles! If you are still looking…I'll take a stab at designing a block! Please let me know. I'd love to play along with this fun project. My monthly White Rabbits To Do list is getting very, very long and a bit scarey but I don't think I can miss out on this one. I'm more a gin and tonic than a martini girl but I do like a nice pair of heels. I would love to join this Desperate Housewife's Quilt group! I feel that I have met the requirements…I am desparate to have some fun! Include me in your mailings/notices!!! Can't wait for the first block!!!! I love the easygoing nature of this quilt along. I'll try to quilt along, but if not, I'll definitely be quilting vicariously! This sounds fun. I am just starting out quilting but think I can handle a block a week. Hmm just wondering if i'm too late to join… i'd try to catch up. I'm very new to quilting, but love the idea of 8" blocks. Sounds like fun! I see that there are some in the first 15 that aren't sure they want to design a block, but I'd be willing if you need someone to fill in. Can't wait for the kick off.